A report from the Central People’s Government of the State of Sandus, published on Veritum Sandus. Audio for this report can be found here. It was believed that the week between XXII and XXIX Aprilo (the 22nd and the 29th of April), the week which saw the demise of the GUM’s Chair Dullahan and the betrayal of Nemkhavia, marked only the bottom point for Sandum-Nemkhav relations. In multiple articles, this State responded to slander and libel against it and only ended when both states agreed to terms for friendship on XXIX Aprilo (the 29th of April). Unfortunately, that agreement was violated this afternoon. The first note was in direct violation of the 29/4 agreement reached between Sandus and Nemkhavia. Such an agreement noted that actions could have been perceived in such a way, but that it was not the intent. Furthermore, the agreement stipulated that all efforts should be taken in defence of that freedom. Indeed, under the authority of the Office of the S8gm8, all action was taken in defence of that agreement, including the clear self-defence of the State as was noted when the Nemkhav Prime Minister slandered this State for the print of an article in the Voice of Sandus, the official newspaper of the Citizens’ Communist Party of Sandus and not the State of Sandus — as this journal, Veritum Sandus, serves. Such an act of libel against this State by such a high-ranking official, and then by his fellow ministers in power, served as violations of the agreement reached on XXIX Aprilo (the 29th of April) and the Nemkhav-Sandum Treaty, which Nemkhavia had proven to violate many times before in Aprilo. The second note served as an extension of the first note’s violation. No evidence has been given by the Nemkhav Federal Government and has been specifically denied to be given when requested by GUM members and delegates. As of yet, no evidence shows and act of an abuse of power by the Sandum delegation or the Sandum government in that diplomatic venue against the Nemkhav Federation or its government. Indeed as of XIX Maio (the 19th of May), the Nemkhav President was suspended from the GUM due to unprofessional and unethical behaviour concerning a blatant slandering of the GUM Acting-Chair and the S8gm8 of the State of Sandus; such a suspension was ruled by both the present and former Supreme Judges Tierney and Caesar to be of legal grounds. With the authoring of this motion and of the subsequent statement received later on, it is plausible that both authors were the President, perhaps acting out of anger or distress. The third note is one, too, which Nemkhavia denied giving any evidence for. Perhaps it was the conversation begun by the Nemkhav Prime Minister, which began with distasteful and harsh words against the CCPS’ newspaper, and this government’s subsequent self-defence of the CCPS’ right to speech and press, which is enshrined within the Founding Law of Sandus, that led to this note. However, at this time, Nemkhavia has isolated itself in its bickering and incompetence. And such begins the issue of the term “officially cut all diplomatic ties with the State of Sandus”. Such a vague term is left up to interpretation, interpretations which may vary from being considered merely speech by the Nemkhav Federal Government or a deliberate change in policy so as to completely by-pass the State. However, to do the latter, as this was surely intended, the Nemkhav Federation would have to completely alienate itself from the State of Sandus. Otherwise, it is by its membership within organisations, such as the GUM, that Nemkhavia shall never completely cut all diplomatic ties with Sandus. It is with the passing of the Federated Republics of A1 that the Nemkhav Federation has seemingly taken over the role of aggressor against this State, as was noted in the Prime Minister’s libel, the President’s immature “joke”, this recent action, and the actions before it. Such a new role of Nemkhavia, which has overthrown the friendship and partnership between peoples, is definitely intended to last the regime of President Whitmarsh, whose social and political policies have nearly always been at the juxtaposition of this State’s. “The Federation has deemed the recent nature of the Sandum State towards the Nemkhav Federation as being “unfriendly” through the actions of its leader, S8gm8 Soergel, towards the Federation itself and its legislators. The Federation thus deems it necessary to annul the previous treaty signed with the State of Sandus as we, the Government, believe it to be no longer in our interests to hold diplomatic relations with the State of Sandus”. Note the parentheses, not common in direct or original statements. This has led the Central People’s Government to believe that this statement was authored by President Whitmarsh and not its presenter, Prime Minister Mejakhansk. This statement, however, gave no actual evidence or reasoning behind Nemkhavia’s militant action, despite the government promising that all questions would be answered by the statement; still, the Nemkhav government refuses to answer questions. Even when the Nemkhav Foreign Minister Hakimoto was asked to comment, Prime Minister Mejakhansk quickly interrupted Hakimoto’s response by stating that he shall give no response; how ironic, then, that Nemkhavia upholds itself as the democratic and freedom-giving micronation within the community, at the same time the Federal Government refuses it of its citizens to comment on such aggressive action and defames foreign media. When such a statement was received, the Lounge of the GUM was in disbelief. M. Mello summed up this disbelief in the simplest sentence: “I hope that is not your full statement.” Unfortunately, it was affirmed immediately after that it was in fact the full statement of the Nemkhav Federal Government. M. Mello continued with his criticism of this statement by stating that he “was expecting something more”, perhaps “specifics with actual grounds”, and that “it seems pretty personal”. M. Mejakhansk indirectly affirmed the belief that he did not author the statement and, rather, ignored answering the question directly by merely saying that the question was “irrelevant”. However, noting the suspicious behaviour of the Federation and the suspicious statement, it is quite clear that Mejakhansk did not author the statement and, rather, President Whitmarsh is the most likely individual to have authored it; following this statement’s defence of the motion, it is also likely that the author for the statement and the motion were the same. Such, perhaps being perceived as ‘irrelevant’ or unimportant by some, would affirm M. Mello’s suspicion and that of this government’s that the President Whitmarsh acted out of personal endeavour for power, the same unethical behaviour that Nemkhavia accused Sandus of without evidence back on XXIII Aprilo (the 23rd of April). However, unlike the Nemkhav Federal Government, this statement and this analysis, approved by S8gm8 Sörgel and M. Caesar of Austenasia, clearly identifies the Nemkhav President as acting out of personal hatred against this government or personal desire for political power. Regardless of the Nemkhav Government’s failure to respond, the Sandum Central People’s Government, following in the advice of the same Libera politics that were slandered on XIX Maio (the 19th of May) by the Nemkhav Premier, has proven that it shall defend itself. By the clear voice of facts, it has been shown that Nemkhavia’s hostile actions against Sandus, which date back to the first violations of Aprilo MMXII (April 2012) of the Nemkhav-Sandum Treaty, have persisted past the mutual agreement reached on XXIX Aprilo (the 29th of April). It is clear, while Sandus has upheld the terms of the agreement that stipulated an end to aggressive talk between both sides, that Nemkhav provocations have continued to the present time and have made relations between Sandus and Nemkhavia unbearable. Sandus would never have taken the action to suspend or embargo relations with Nemkhavia, noting Sandus’ history with Nemkhavia, but that action has been taken by Nemkhavia, with no care for smaller and less powerful nations such as Sandus. It is a testament to the dedication of this government, which is much smaller than the other governments of micronations amongst the elite in the intermicronational community, that Sandus has persisted against all her enemies; it is a testament to Libera politics, the topic that preceded this very issue, that Sandus has continued against such a large and over-bearing nation such as Nemkhavia, being over-bearing even towards her own citizens. Whilst Nemkhavia may falsely propagate that it is the bastion of democracy, freedom, and peace, Sandus has been a victim of Nemkhavia for those reasons: Sandus has defended her media and that right of her citizens, Sandus has caused no undue harm or done no undue ill-deed against Nemkhavia, and Sandus takes the consideration of all her citizens and partners into account upon enacting law and policy. On all of the “maxims” of Nemkhavia, Sandus has excelled beyond them and has proven its perseverance to Libera and its dedication to herself. 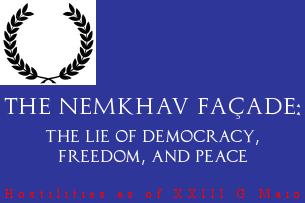 So while Nemkhavia claims its defence of democracy and liberalism in the intermicronational world, this façade of Nemkhavia is stripped away by President Whitmarsh’s own corruption and the Nemkhav Federal Government’s own incompetence to destroy the same façade they have constructed.